I knew I was in trouble the minute I ordered my usual Diet Coke. “No, you’re not,” said Norma Kamali, who clearly did not approve of my beverage choice. She’d just asked for hot water with lemon to accompany her salmon. In fact, she was so horrified by its toxic presence on the table, it was banished from the photo taken to accompany this column. 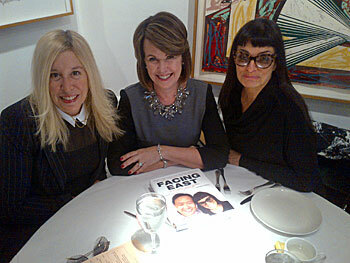 I guess I shouldn’t have been all that surprised since Norma and HarperCollins’ Lisa Sharkey joined me at Michael’s today to talk about the new book, Facing East: Ancient Health + Beauty Secrets for the Modern Age by Dr. Jingduan Yang written with the iconic fashion designer. “If you want to age, keep drinking that,” she told me. Where’s that hole in the floor? Since the 70-year-old designer doesn’t look a day over 45, I’m thinking that just might have been my last glass of soda for a while. At the same time, Lisa, who had met Norma at Physique 57, also came to know Dr. Yang separately through his book agent. Clever Lisa, who used to book Dr. Mehmet Oz on Good Morning America during her days as the show’s senior producer “before he was Dr.Oz,” came up with the inspired idea of having Norma and Dr. Yang collaborate on a book. “The concept was so authentic. I wanted to take what was happening in real life and make it a book,” said she between bites of red snapper.